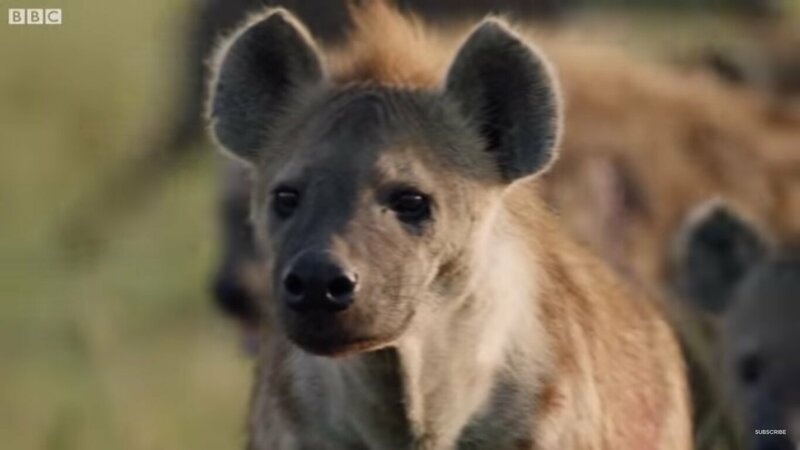 In A BBC program titled Dynasties, recently one clip alone from that show went viral on the Internet, in which one lion takes on over 20 hyenas in a shocking display of the realness of nature. 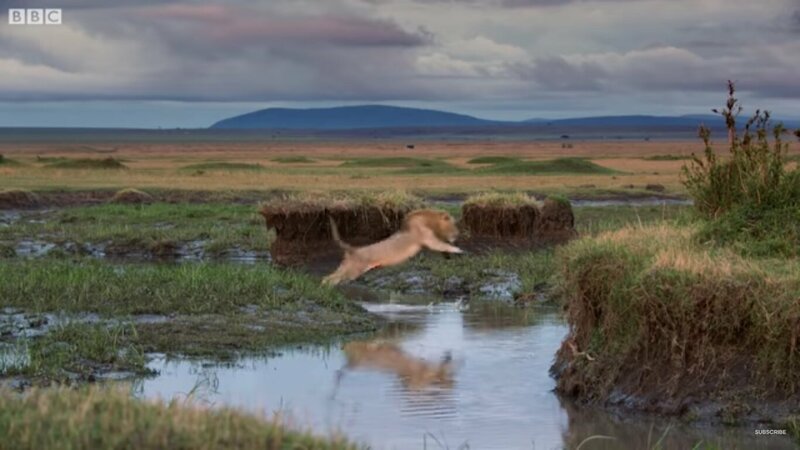 The clip begins with the narrator explaining that at a certain point of maturity for a young lion like this one, they begin to explore the perimeter of their territory and really get out there and see who’s boss. The lion named Red really wasn’t necessarily looking for trouble despite being an apex predator, and he was simply roaming those open grassy plains alone, until he stumbled into the wrong neighborhood: a crowded area packed full of hyenas. Initially, it’s a peaceful scene, as the lion hops around a couple times elegantly like a giant cat of the Savannah, going wherever its heart tames him. Soon however, a pack of at least but possibly more than 20 hyenas are facing him, and they sort of taunt the apex predator and giant cat with their notorious laugh. You can see the poor lion is suffering from anxiety when he’s surrounded by all those sharp toothed, predator hyenas, and the narrator Attenborough adds to the suspense by informing the viewer that “This number of hyenas could kill him” as they pack tries to make a move. So what does the lion do in defense? Its mighty roar was almost sufficient to scare off the tiny, predator creatures, but he also had to bite one hyena and grab it by the leg as the others move in for the absolutely daring attack. Ever had a fight, and you were losing until all of the sudden your cousin shows up? That’s precisely what happened here. Suddenly Red’s cousin Tatu, another male lion, burst onto the scene and by that time the victory was decided. He charged straight toward those hyenas, and they scattered and admitted defeat. 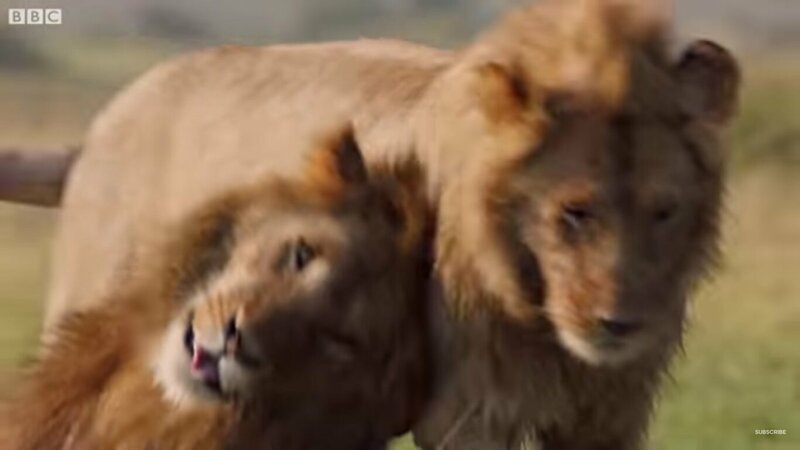 By the end of the clip, big cats are exactly what those two lions looked like: they are seen rubbing up against each other affectionately, like a couple cousins teasing each other and pushing each other in a friendship type of way. It’s certainly a happy ending to a tense situation, and that’s how life is. There’s something that is wholesome beyond wholesome about gaining satisfaction from watching nature shows. It doesn’t get more wholesome than that when it comes to television, does it? Thankfully nothing terrible happened in that clip, those giant cats managed to stay safe, even though they also would tear another animal apart because they can’t quite help being apex predators either.